Autonomous vehicles will impact the built environment. The time to plan for it is now. Everybody's talking about disruptive transportation technologies. There's the sharing family: bike share, ride share. Related, but slightly different are ride-hailing or transportation network companies — the core business for Uber and Lyft. Then there are next-generation electric cars, and tiny, one- and two-person vehicles that make even compact cars look like barges. Now add to the mix the ways that consumers and businesses get goods. Forget going to a store; your stuff is getting dropped on your doorstep by a truck — and soon, a drone. And finally, the big guy: autonomous vehicles. Driverless cars have been promised for years. But today, all signs point to their imminent arrival. Below, Florida State University's Tim Chapin, Lindsay Stevens, and Jeremy Crute lay out how AV technology will affect the built environment. Are you planning for it? You'd better be, they say. After you read that, cruise through a series of edited interviews with planners and others at the leading edge of what's next in transportation at Uber, Nissan, and Zagster. It's all part of a transportation revolution where the privately owned car is no longer the only ride in town. At the turn of the 20th century, a new technology originally referred to as the "horseless carriage" came along and completely transformed the planet. Once Henry Ford developed a process for mass production that made them affordable, automobiles quickly drove shifts in personal and commercial transportation. The benefits of increased mobility and accessibility to previously far-flung places changed how and where people traveled, and within a few short decades, the American landscape was remade. In the last century — what in retrospect we might term the "Suburban Century" — U.S. cities experienced an outflux of wealthier households to suburban areas accessible only by the private automobile. The middle class soon followed, as did supporting retail and services. In the latter third of the century, large-scale employers also left downtown cores, and what were once termed "edge cities" emerged where highways intersected on the urban periphery. Looking back now, it's clear that the automobile was a transformative technology, one that improved the lives of billions, contributed to fast-growing urban and suburban economics, and changed where people lived, worked, and shopped. Cars also brought new challenges in the form of regional congestion, air and water quality issues, and ugly, placeless corridors that served automobiles first and human beings not at all. Much of this transformation occurred during the early decades of professional planning in the U.S. An oft-cited narrative of our profession is that the creation of America's automobile-oriented landscape proceeded without sufficient, strategic, or long-term oriented input from professional planners. If planners had the skills, data, and political connections of modern times during the rise of the automobile, the world could have been a different and better place. There is good news, though. Urban planners have another turn at bat, but to make the most of this opportunity, the profession must understand the need to step up to the plate. In the next few years, the U.S. will see the next great transformative technology hit the streets of metropolitan areas. Autonomous vehicles — referred to here as AVs, but also colloquially known as driverless cars, self-driving cars, and robot cars — will again usher in a transformation of our landscape similar to the one brought on by the Model T more than a century ago. At its core, the concept of an AV is very simple. In an AV world, the automobile no longer requires a human driver to operate it. Instead, the vehicle navigates streets safely and efficiently through a complex but elegant mix of software and hardware that combines remote sensing, recognition algorithms, network analysis, and "experience" drawn from millions of hours of driving that is shared across AVs. Once a human operator becomes unnecessary, travel and travel behavior will almost certainly change radically. Riders will be able to sleep, read, text, surf the web, and work during their travels, making work commutes and long trips feel less onerous. As the vehicle can now park itself, riders will want to be dropped off as close to their destination as possible, and the car can pick riders up at whatever destination they request. Individuals who cannot drive — including older adults, those without licenses, and children — will see their mobility increase dramatically. AVs are emerging as other changes in the transportation industry come to the fore, most notably car sharing and on-demand services like Uber and Lyft. Taken together, the expectation is that private car ownership will decline, and that individuals and households will subscribe to AV services that deliver a vehicle on demand. The research to date suggests that AVs provide great promise for improving the safety and efficiency of our transportation systems. To see these benefits, though, planners need to begin anticipating the needs and impacts of AVs, and to fold this technology into long-range transportation plans. While the question of when AVs will be mass produced and come to dominate the market remains unclear, our review of industry data points to 2040 as a tipping point when more than half the cars on the road will be able to operate autonomously. Regardless of when AVs hit the streets, there is certain to be a transition period where human-operated and autonomous vehicles will share the roads. Consequently, it is imperative for planners to begin preparing not only for a fully autonomous future but also for the safe and smooth transition from human- operated to autonomous vehicles. "Now is the time for state agencies to provide leadership on AVs, encouraging and directing metropolitan planning organizations and local governments to recognize and plan for the transportation impacts of this remarkable technology," says Ed Hutchinson, manager of the Florida Department of Transportation's Data and Analytics Office. "Our road systems will need a makeover once AVs gain a foothold in the consumer market." From top: a typical modern streetscape; what a 2040 streetscape transitioning to AV use could look like, with dedicated lanes for AVs to allow efficient "platooning" and to avoid interference with human-driven vehicles; and a concept drawing of a 2060 streetscape in a fully autonomous city. Photo and images courtesy Tim Chapin. 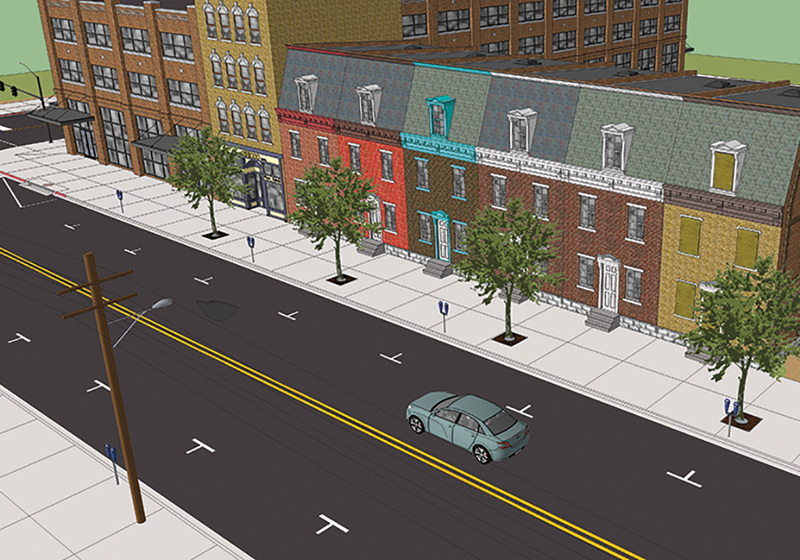 What a 2040 streetscape transitioning to AV use could look like. A concept drawing of a 2060 streetscape in a fully autonomous city. The rise of AVs will also bring challenges — and opportunities — for improving our built environment. While the potential transportation benefits of AVs are being investigated and documented, far too little attention has been paid to the impact of this technology on our urban and suburban communities. Just like the horseless carriages of over a century ago, AVs will remake the nation and the planet in the coming decades. In a study funded by the Florida Department of Transportation, our team of researchers in the Florida State University Department of Urban & Regional Planning completed one of the first assessments of the potential land-use and site design impacts of AVs. The report, Envisioning Florida's Future: Transportation and Land Use in an Automated Vehicle World, details some of the potential impacts of AVs on the built environment. Over the course of this project, which drew upon academic and industry literature and employed focus groups made up of planners and transportation industry stakeholders, several built environment impacts were identified. The impacts of AVs on roadway design and functionality will be profound in the long run. Since driverless vehicles are expected to be smaller in size, drive more precisely than humans, and have the ability to travel in harmony and platoon, travel lanes will likely be narrowed. That would allow for smaller rights-of-way and different allocations of space along existing rights-of-way. Fewer overall vehicles, combined with AVs' ability to communicate with each other, could bring further efficiencies and more opportunities for reclaiming rights-of-way for other uses. AVs also offer an exciting opportunity to declutter our urban and suburban environments. As human drivers are phased out, a huge percentage of street signage and traffic signals at what have been termed "free-flow" intersections will be unnecessary. Riders will instead leave the driving to the vehicle, and directional signs and advertisements pointing riders to destinations can be delivered electronically through the vehicle or directly to the rider's mobile device. As a result, significantly fewer signs of any kind will be erected along our communities' rights-of-way. 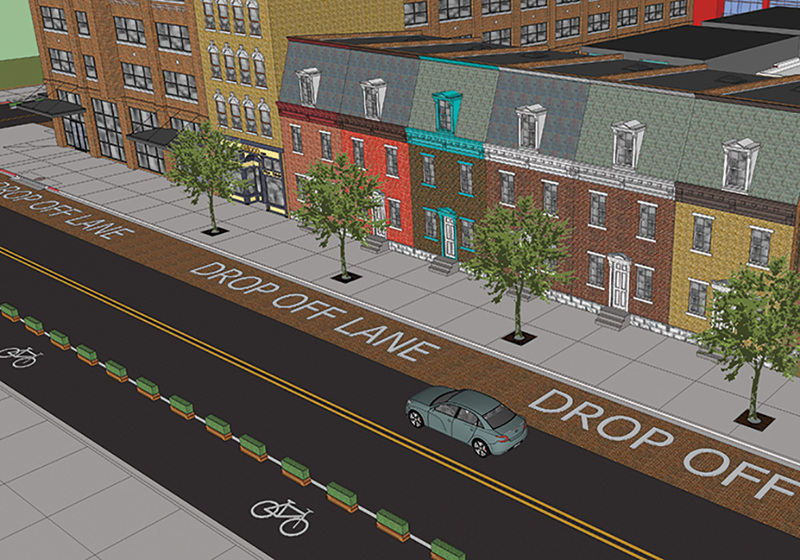 Reduced lanes in urban areas may allow for road diets and more aggressive complete streets initiatives, providing room for bike and pedestrian infrastructure expansions. Counterbalancing this opportunity will be a need to segregate AV, bicycle, and pedestrian traffic, as our research indicates that AV, bike, and pedestrian interaction may be safer, but at the cost of slowdowns to all modes of travel. Free-flowing intersections, most notably, promise to improve intersection throughput, but these efficiency benefits will only be possible with separated bike/pedestrian infrastructure to prevent the need for traffic to stop. The ability of AVs to park themselves, or park very rarely, in the case of shared vehicles that would immediately move off to their next rider, will lead to massive impacts on land development. As riders will want to be picked up and dropped off as close to their origin and destination as possible, drop-off zones will need to be incorporated into most locations, but in a way that does not inhibit the flow of traffic. Care will be required to locate and design these zones, as poor spacing and design can slow traffic and hinder bicycle and pedestrian travel in areas with high numbers of drop-offs and pickups. A typical street design with on-street parking today (top) and (bottom) reconfigured with drop-off lanes for AVs. Narrower rights-of-way may also be redeveloped into protected bike lanes. Images courtesy Tim Chapin. A typical street design with on-street parking today. Reconfigured with drop-off lanes for AVs. 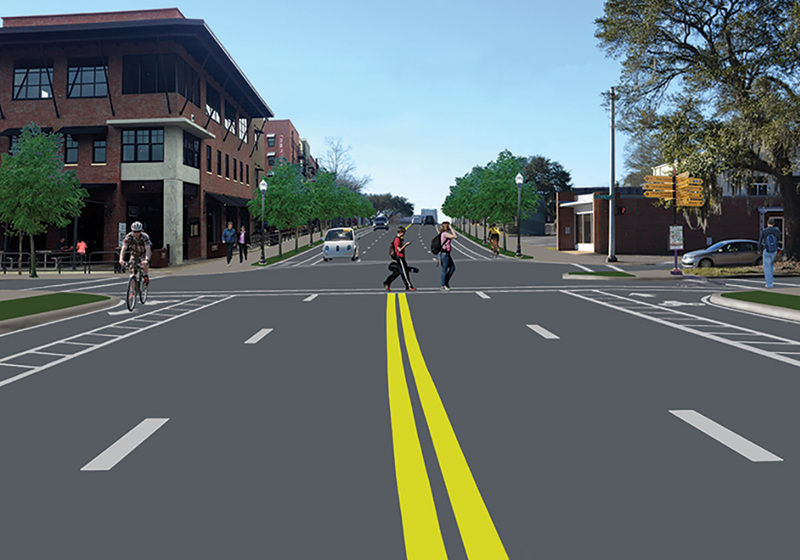 Narrower rights-of-way may also be redeveloped into protected bike lanes. With drop-offs likely to replace parking, we envisioned what the future of one of our hometown's streetscapes would look like over time. 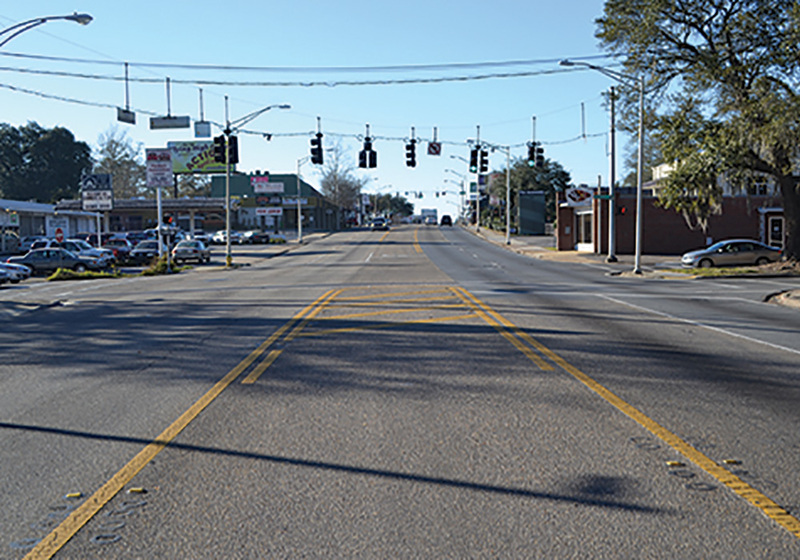 In Tallahassee, Monroe Street bisects the city and travels north to the interstate. In the top image you can see Monroe's current condition as a typical, auto-dominated urban arterial. As AVs emerge into the market, we foresee the evolution of the street to include separated AV and human-driven lanes (see photos on page 19) . 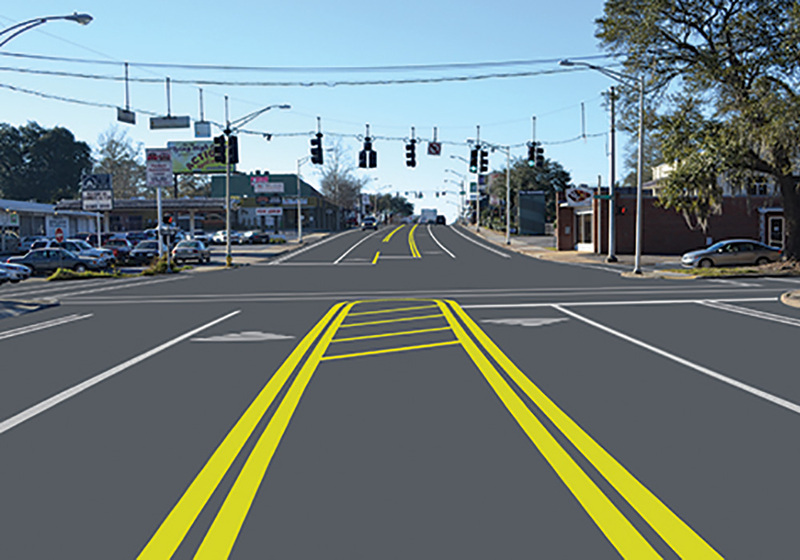 Moving forward into a fully-AV world, Monroe Street no longer has traffic signals, and the outer lanes serve as drop-off zones. A major opportunity rests on what to do with the superfluous parking found in most cities and suburban areas. As far less parking is required once AVs have taken over, and because parking can be disconnected from almost all land uses, the form and location of parking will change. Downtown areas and high-density nodes might construct off-site parking reserves, akin to those found at airports. The ubiquitous surface parking lots sitting just outside typical office and retail developments will no longer be required, freeing much of this land up for other uses. 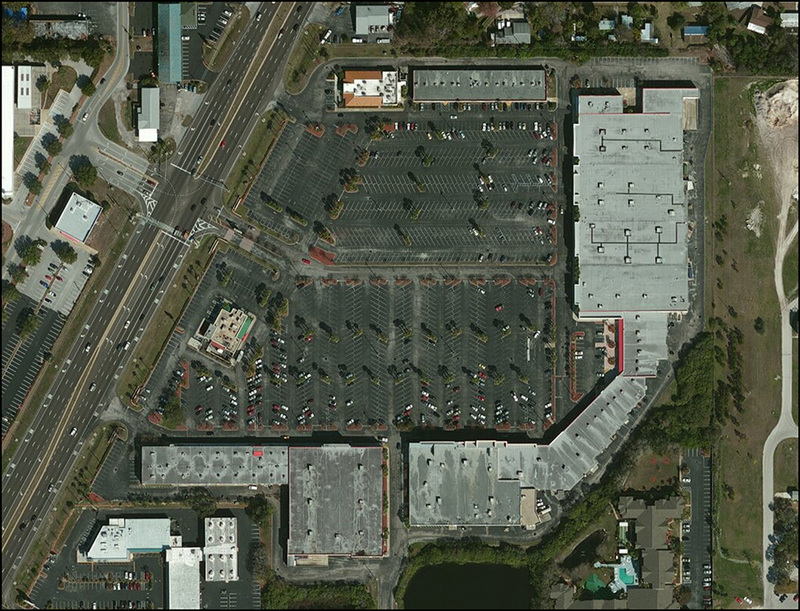 A typical suburban strip mall design today in Pasco County, Florida (top), and a conceptual site design for AV-oriented commercial redevelopments. Images courtesy Tim Chapin. A typical suburban strip mall design today in Pasco County, Florida. A conceptual site design for AV-oriented commercial redevelopments. 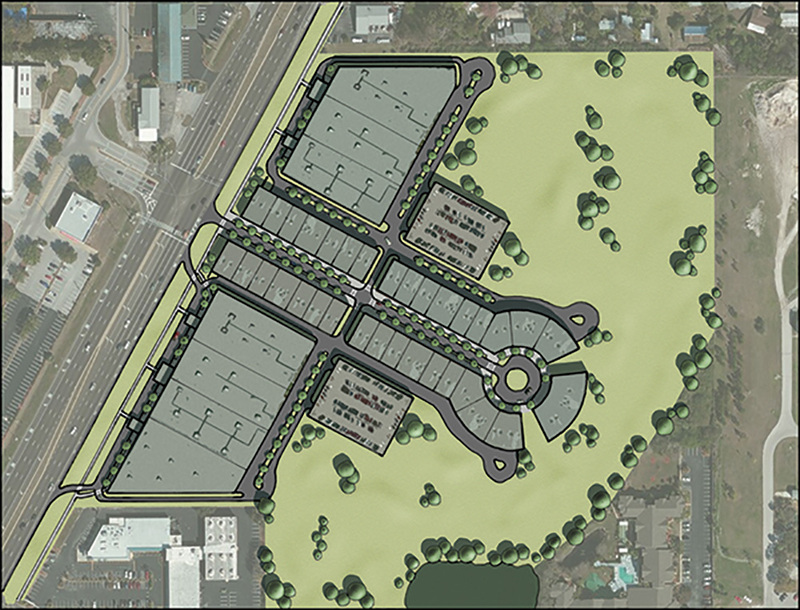 The figures above show the potential redesign of what is currently a suburban strip mall with a massive surface parking lot in Pasco County, Florida. If the site were developed at the same intensity in a world where AVs rule the roads, the mall might include drop-off zones along the major arterial, limited on-site parking, service alleys in the back, and a much more people-friendly design along a retail corridor. This existing auto-dominated land use can be redeveloped into a place that serves humans first and vehicles second. Clearly, when it comes to AVs, much more is unknown than known at this stage. How soon will a fully functioning, safe autonomous vehicle be developed? How quickly will these vehicles find their way into the consumer market? Of the many major players involved (Google, Apple, Tesla, the traditional automakers), which standards and features will eventually come to dominate the market? How and in what ways will vehicles connect with each other and with the infrastructure that serves them? How will AVs affect transit systems? Given this uncertainty, the planning community might be tempted to take a "wait and see" approach. However, to do so would be folly and lead to a repeat of the American experience with the automobile — where the needs of the technology shaped changes to our built environment. Instead, we believe that now is the time for the planning profession to help direct the impact of AVs on our communities. While much is unknown about the technology, there are some strong signals that parking demand will go down and that some parking will be replaced by drop-off zones, and that signage will reorient away from drivers of fast-moving vehicles. This provides opportunities for redevelopment and the (re)creation of places for people rather than for cars. "Local governments need to think about and plan for the coming AV revolution, as these vehicles will not just change the way we travel but the look and feel of our communities," says Suzanne Konchan, AICP, the growth management director for St. John's County in Florida. "Done correctly, AVs can promote more and better people-oriented places, which is ultimately what our citizens want and, of course, what planners hope to create." So what can and should planners be doing? Educate themselves on the technology. First and foremost, our experience with the planning community in Florida makes it clear that planners need to get up to speed on the technology and its likely behavioral and development impacts. Too many planners believe that AVs are simply the next generation of the automobile, when in fact they are a transformational technology that will shape our communities for decades to come. Incorporate AVs into long-range plans. Long-range planners should be thinking about the effects of AVs on roadway design, parking demand, and pedestrian-oriented spaces. Planners should begin incorporating AVs into our long-range transportation plans and roadway design manuals. As AVs move closer to adoption, planners will need to develop appropriate design standards for AV roadways and other infrastructure, such as drop-off and pick-up areas. Additionally, careful planning of how AV infrastructure is integrated into bike and pedestrian networks will be a vital part of efforts to create human-centered urban spaces without substantially undermining AVs' efficiency. Rethink parking standards, types, and locations. Planners will need to evaluate and likely relax existing parking standards with an eye toward a time when shared parking facilities can be consolidated into fewer, larger holding areas or structures. Long-range land-use plans should consider the placement of appropriate areas for parking and holding areas for AVs outside of the urban core. As the demand for on-site parking diminishes, existing parking lots and garages will become potential redevelopment sites. Incentives for redeveloping surface parking lots may become a key tool for revitalizing urban cores and retrofitting suburban strip malls. In sum, now is the time for planners to consider how the coming AV revolution can be used to help remake the nation's transportation corridors and communities as people places. The last century-plus of the horseless carriage is coming to an end, and soon dawns the age of the robot car. The planning profession has a great opportunity to learn from past mistakes, and make sure that human-centered planning drives how AV technology will impact built environments — and not the other way around. Tim Chapin is a professor in the Department of Urban & Regional Planning at Florida State University. Lindsay Stevens is planner-in-residence and Jeremy Crute is the senior planner there. "Autonomous Vehicles Zoom in the Public Imagination in 2016": www.planning.org/blog/blogpost/9117693. "When Autonomous Cars Take to the Road," Planning, May 2015: www.planning.org/planning/2015/may/autonomouscars.htm. "Driverless Vehicles and Your Community," The Commissioner, December 2016: www.planning.org/media/document/9116095. Autonomous Vehicle Technology: A Guide for Policymakers: rand.org/pubs/research_reports/RR443-2.html. "Autonomous Future" is a series on the impact of AVs from Planetizen: planetizen.com/taxonomy/term/43854. Federal Automated Vehicles Policy: www.transportation.gov/AV. 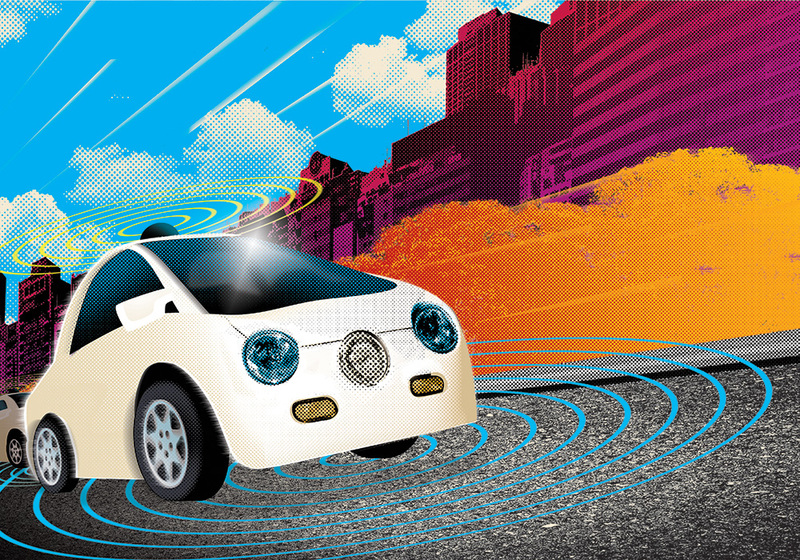 Driverless: Intelligent Cars and the Road Ahead. MIT Press, 2016: mitpress.mit.edu/books/driverless.